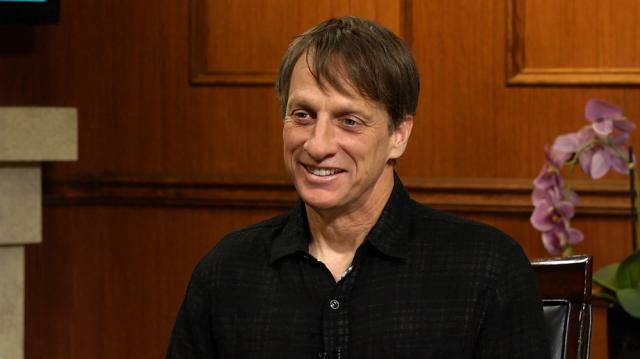 Skateboarding megastar Tony Hawk joins Larry for a second time to talk his sport's entry into the 2020 Tokyo Games, his efforts to build skateparks across the U.S., and what the future holds for his famed video gaming franchise. Will Tony Hawk coach the 2020 U.S. Olympic skateboarding team? Tony Hawk: If not skateboarding, then what? Even if you're not a skater or a gamer, you've probably heard of him. Tony Hawk is the man often credited with leading the sport of skateboarding from the fringe to the mainstream, thanks to his record-setting pro career in the 1990s and the many installments of his hit video game series that have been released since. And more recently Hawk has turned his attention to charity work, as his Tony Hawk Foundation has now built more than 500 skate parks nationwide. In this episode of Larry King Now, Hawk sits down with King to discuss his Foundation's recent milestone, skateboarding's recent addition to the Olympics, and what the world's most famous skateboarder might have done if he chose another career path. As one of skateboarding's most visible ambassadors, Hawk has long been an advocate for the inclusion of skateboarding in the Olympic Games. Skaters everywhere got their wish when it was announced that skateboarding was one of several sports being added to the Summer Olympics in Tokyo 2020. Hawk weighs in on the announcement, and sees it as an example of skateboarding's growing profile nationwide. When he was a kid, he says, there was no such thing as dreaming of a career in skateboarding. But now he is excited that young skaters from all over the world can dream of representing their country on the international stage. Hawk also shares various anecdotes from his career, from what he thinks makes a good skater (someone who is willing to take risks) to the worst injury of his life (a broken pelvis) to his first experience playing what would become his first branded video game (he skated around an empty map as a digital Bruce Willis). And though he has no regrets about his eventful career, Hawk says that he has always been a technology geek, and if he weren't a skateboarder he likely would have pursued a career in video production or editing. But instead, he'll keep working on expanding the impact of his Foundation and on building the reputation of skateboarding worldwide.